From Dark Mode to Dynamic Desktop to Finder metadata to Quick Look editing and its new Apps, Mojave features some of the most visually attractive and compelling changes to macOS without also introducing complex new shifts in behaviors in how the system works with apps and documents that build on what we've known rather than changing them. It's easy to recommend Mojave as an update, but going even further: the new release creates confidence in buying a new Mac, as it paints a picture of competence and incremental advancement that Mac buyers can expect to get every year after they buy their new machine for a solid four or five years--Mojave actually supports some Macs going back eight years. A lot has advanced since the first Public Beta﻿ back in June. Dynamic Desktop is now functional, so the included Mojave desktop dune image, and a simpler "solar gradient" color desktop, will now automatically change to give you a sense of the time of day as you work. 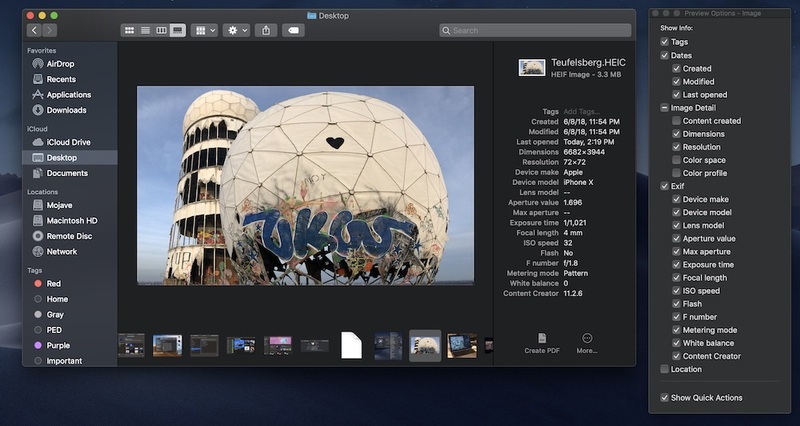 Finder Extensions provide simple, iOS-like editing tools without needing to open an app. The metadata shown in the Preview Column in Gallery View is customizable. New Stocks and News apps come from iOS, but look and feel even better on the Mac. And to get ready for this, Apple is also launching an all new Mac App Store, patterned after the enhancements it made to the iOS App Store last year. These include curated collections of software specific to Creators, Developers, Workers and Gamers, with stories and videos that make it easy to find the software you're looking for. Improved merchandising of apps resulted a solid improvement in iOS app sales, and should also dramatically improve the usefulness of the Mac App Store--as well as get things ready for new UIKit apps arriving next year. The new Mac App Store offers more curation and recommendations. Since the first consumer 10.0 version was first released 17 years ago, Apple has introduced 14 major new updates--compared to just 9 major version numbers across the first 17 years of the Mac's existence under the classic Mac OS system software. After years of radical overhauls that modernized its printing, networking, file system and media handling; made huge shifts to 64-bit and Intel processors; and introduced entirely new capabilities from Time Machine to iCloud integration to Continuity to memory compression--one could say that Apple's macOS platform has now reached a Golden Age. One aspect that is improving--but at an often frustratingly slow pace--is Siri. After brining its voice assistant to the Mac, Siri continues to gain new features, including hands-free "Hey Siri" support on brand new iMac Pro and the latest TouchBar MacBook Pro models. Plus it now has the handy ability to find your AirPods or iOS devices or control HomeKit devices--as well as more questionable abilities to ask about holidays or celebrities or sporting events. However, it still struggles in other areas. Ask it to turn on Dark Mode--a natural expectation on a OS release defined by the new feature--and Siri plays the role of HAL 9000 in 2001. You can, however, quickly switch into Dark Mode using a keyboard shortcut or a new Automator Action installed in the TouchBar with Mojave﻿. Siri is afraid of the Dark. Instead, Apple continues to disrupt the market for PCs by offering competitively priced iPad models that are simpler to individuals use and easier for companies to deploy, with a focus on high mobility rather than seeking to replicate all the functionality of legacy desktops and a windowing environment--much of which is simply unnecessary for users with streamlined needs. It's not hard to understand why. A decade ago, PCs and Unix were dominant computing operating systems. Today, iOS 11 represents the largest, most valuable platform--larger even than Windows 10 and far more valuable than devices running any version of Android. As a premium bank of users, iOS is simply the best demographic Apple can market its Macs to--and those premium buyers with an interest in the newest technology are already inside its stores. One of the unique features Apple sells on iOS is privacy and security--enabling users to decide if they want an app to be able to send notifications, access their camera or use their location. In Mojave, Apple has also brought more of these controls to the Mac, requiring apps to ask for permission to access the camera or microphone, or to read data from Mail or Messages, or backups from Time Machine or iTunes. Apple is also making it easier to use strong passwords, and to find and strengthen weak passwords used across various online accounts--something I've caught myself doing, even after the massive account breaches at Yahoo and Equifax. With iCloud syncing between iOS and Mac Keychains, this makes it even more attractive to iPhone buyers to opt into buying a Mac. Additionally, Siri can now be used to look up passwords without manually navigating through the Keychain app. Migration Assistant now moves more types of files. Microsoft now supports Windows across everything from low-end 32-bit ARM, Celeron and Sempron chips to high-end Epyc and Xeon processors, and across a range of PC hardware--from limited RAM and minimal SoC GPUs to the other extreme of components. In contrast, Apple's entire Mac range uses mainstream 64-bit Intel processors, roughly consistent supplies of RAM, and--now under Mojave--both supporting Metal-optimized graphics hardware and making it a minimum requirement. Mojave requires a Metal-capable Mac. This greatly simplifies Apple's development of macOS and enables the company to rapidly introduce new technologies like Metal--the same way that exclusively running iOS on premium devices with consistent hardware specifications makes it much easier to upgrade and improve compared to the fractionalized world of Android, stretched thin across a disparate range of mostly low-end, under-specced devices. Mac buyers often pay a premium upfront over Windows PC alternatives, but they can also expect to get free, significant annual updates across the next five or so years. Windows hasn't even been updated since version 10 appeared in 2015; new versions before that came out about every three years between Vista, 7 and 8, and these struggled to justify their $120 to $200 upgrade prices by adding flamboyant and often unappreciated features such as the Metro UI and other radical--sometimes arbitrary--shifts that turned off many users. Apple’s macOS Mojave is still a work in progress, but the strategy is clear: Welcome to the Mac for iOS users. And Don’t Panic! Despite making the hardware business look easy, Apple hasn’t always been incredibly successful in introducing new devices. But comparing its biggest hits with its worst misses helps to isolate a secret sauce that is driving demand for the company’s products globally.